On our first day of orientation in Thailand our Thai language teacher told us that by the end of the week we would be using "555" in everyday conversation. What is "555," you ask? It's the Thai version of LOL! The number 5 in Thai is "ha" so 555 is HAHAHA. Lo and behold after my first week in Thailand I have found myself texting my friends here "555." This is one of the many things I have learned to love about this country during my first two weeks here. Leaving home for a year to go over 8,000 miles away was a big commitment. I wanted to do this to make a difference and push myself to my limits, and I know during my time here in Thailand that is exactly what will happen. Leaving and getting on the plane was slightly terrifying and at points it seemed like it was a never-ending journey to get here. But, when I stepped off that plane and into the airport in Bangkok my fears started to disappear and the sweating began! I will not sugarcoat this for anyone, it is hot here, very hot. However, what is a little heat and sweating when you are in such an incredible country? I have only been here for a short time but the heat is starting to be a nonissue as there are so many other things going on, that it is never really on my mind. The past few days have gone by at lightning speed. Orientation was over in a blink and before I knew it I was in my new home in Chiang Kham. Teaching does not begin until October 28th, which leaves plenty of time to explore my new town! 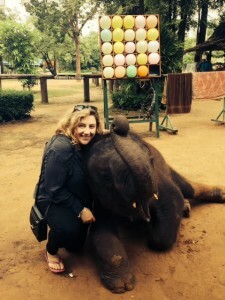 So what have I been up to since I arrived in Thailand? Eating, exploring and learning! The food is something that continually amazes me here. Everyday there is something new and exciting to try. Sometimes it is spicy beyond belief, sometimes it is something that you think you could never like and it turns out to be delicious! 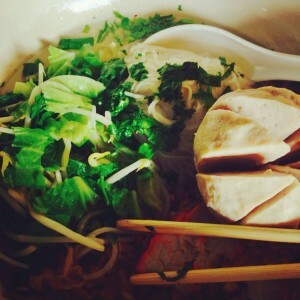 I have learned when it comes to eating here you cannot be afraid to try new things. Most of the time you will be surprised because whatever you are trying is so delicious! Another thing I have learned is that you have the luxury here of eating cheap. This gives you the opportunity to try many different things without breaking the bank. I find myself getting more adventurous with the food here every day. 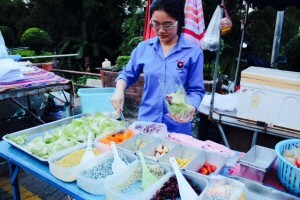 I have just discovered the evening market in Chiang Kham, which will provide endless new options for food discovery! Every place I have been in Thailand has been polar opposite of the previous place. Bangkok reminds me of New York and California meshed together into one giant city. 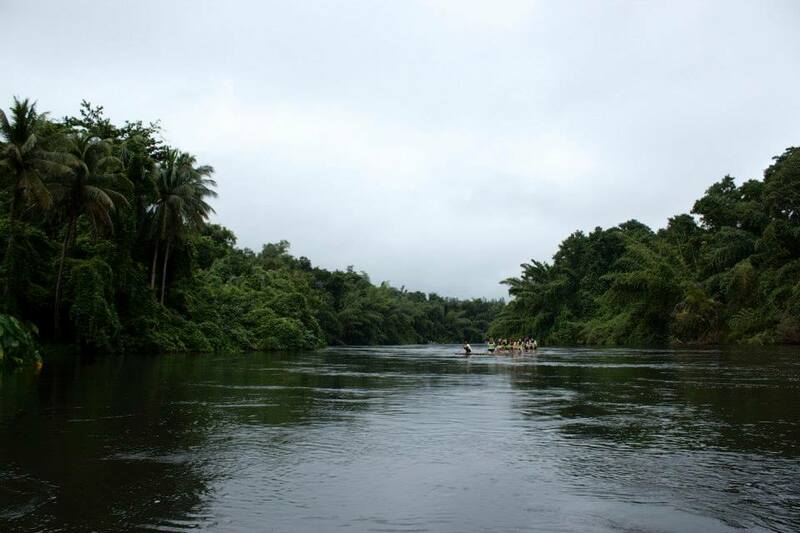 Kanchanaburi is full of breath-taking scenery and amazing wildlife. Chiang Kham reminds of Vermont: rolling mountains, farms and its quiet. We spent the majority of orientation in Bangkok. 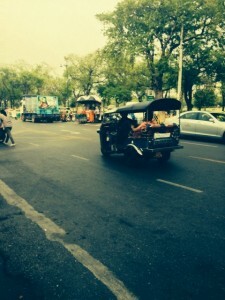 Bangkok is unlike any other city I have ever been too. It's as though in the city, tiny little towns exist and just walking a few blocks down the road you stumble upon a completely different place. There is never a dull moment in Bangkok. Everyone is always on the move and the city is always busy and packed with people. The smells, the sights and the noise can overwhelm you at first. After a day in Bangkok you get used to all the goings-on and you want to be a part of everything you see happening. I cannot wait to return to shop in the markets, try new food and maybe sing some karaoke! The last two days of orientation we got to spend in Kanchanaburi and it was an experience I will never forget. Just a short 2.5-hour trip outside of Bangkok and you are in another world. 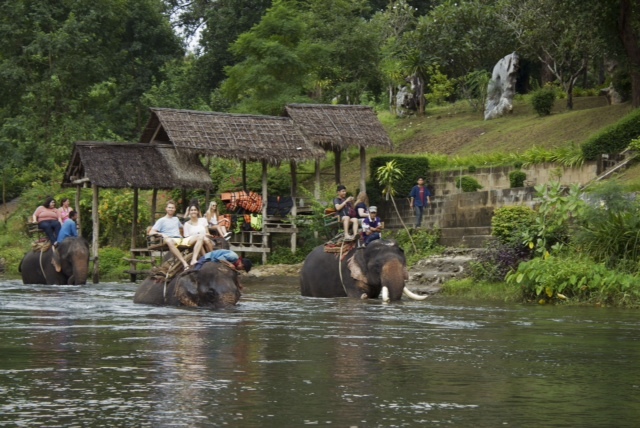 My favorite moment in Kanchanaburi was traveling down a river on a bamboo raft and getting to ride an elephant! This has been the highlight of my time in Thailand so far. You forget everything else that is going on and just have the time of your life. Elephants are incredible creatures and getting to interact with them was unreal. Thailand is full of never-ending surprises. Today I ran into the woman who works in the area that we live in. We had some trouble communicating and after several minutes of various hand gestures and confused glances I almost gave up. Then she saw in my room I had a little sign that said "555." She gestured towards it and looked at me and smiled and went "HAHAHA." This brought a smile to my face that even though we could not understand one another, this was one thing we both knew! This goes to show that you can find common ground with someone you thought you could not communicate with! I cannot wait to start teaching next week! I have spent my time at night preparing some lesson plans and going over the teaching materials. I am really looking forward to meeting all of my students and embarking on this adventure as a teacher. Every day I teach the students, I hope to learn something too. 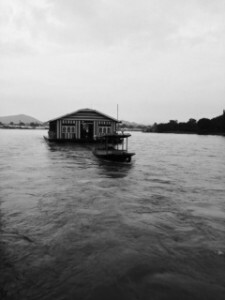 I also hope to know my town better as time goes on and go on many adventures in and around Chiang Kham.